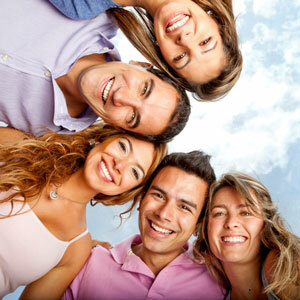 Painless, natural-looking veneers – all in one visit! Do you have a tooth or two that could use some extra attention? Maybe you’ve put off going to the dentist because you want to avoid a procedure. But what if you could have a completely new smile in under an hour? EasySmile Lifelike Veneers makes it possible with a new non-invasive option! Dr. Malone is pleased to announce that he is now offering this new cosmetic procedure to patients in Escondido. Only a handful of dentists have been trained with this new technology, and Dr. Malone is among the first in the country to feature this innovative approach. BEST OF ALL: See how your Preview Veneers look before making a final decision! EasySmile Lifelike Veneers are a fantastic option for those who are looking for a simple, painless, affordable way to refresh their smile. It requires NO shots and NO drilling and can be completed in about an hour. This is the pain-free solution so many patients have been waiting for! Best of all, this process starts with a smile preview veneer that is made in minutes and tried on your tooth, letting you see how you will look before having any work done. Now you no longer need to worry about how your teeth will look, because you’re able to take a look and try it out before you decide. Developed by a dentist, the veneer is made of durable material as thin as a contact lens, and it is placed directly over the teeth so that they don’t have to be filed down. This method allows for perfect alignment, beautiful matching to adjacent teeth, and a natural appearance. Don’t let the high cost of porcelain veneers keep you from having the smile you want! This simple, affordable option may be just what you’re looking for. You could have a new smile in one visit!